Kaffe Matthews, Artist Talk: Sound Art, 2006. Courtesy of the artist. ISIS Arts and AV Festival 06 presented informal talks by three sound artists, who discussed their work, techniques and inspiration: Zoë Irvine, Kaffe Matthews and Adinda van ‘t Klooster. 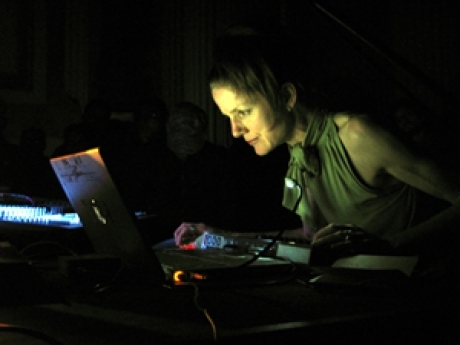 Zoë Irvine is a sound artist and audio producer based in Scotland. Her practice includes the creation of publications, installations, soundwalks and net projects, including her most recent project Dial a Diva. She is the recipient of a Creative Scotland Award. Kaffe Matthews is a live sampling and laptop performer, based in the UK. She specialises in live sound performance and sonic sculpture, and has performed in venues ranging from galleries, clubs, concert halls, tents, churches, warehouses, and ambient tea rooms. Adinda van ‘t Klooster is based in Newcastle upon Tyne and has worked with a wide range of media such as video and interactive sound installation, animation and sculpture. Commissions include a 16-channel sound installation for the Lincoln City and County Council Museum for Archaeology and Art. Supported by the European Social Fund and Arts Council England.